In the context of the Higher Education Standards Framework (Threshold Standards) 2015 (HES Framework), ‘scholarship’ means those activities concerned with gaining new or improved understanding, appreciation and insights into a field of knowledge, and engaging with and keeping up to date with advances in the field. This includes advances in ways of teaching and learning in the field and advances in professional practice, as well as advances in disciplinary knowledge through original research. across a provider as a whole (e.g. policy frameworks, resource allocation, cultural expectations, staff development). As detailed below, the concept of scholarship arises in several sections of the HES Framework with varying emphases. transmission of these advances through effective, contemporary approaches to teaching and learning, and research training if applicable. A broader range of activities is included within the general scope of professional development, and scholarship is a sub-set of these activities concerned with advances in knowledge. Research is in turn a sub-set of the various types of scholarship that is limited to generating new knowledge. teaching – a central element of scholarship involving the development of well-informed and knowledgeable teachers, leading to teaching that promotes active and critical learning in students based on advances in a discipline or in knowledge about effective teaching and learning and course design practices in a field. As noted by Rice (1992, cited in Robinson and Hougaz, 2013, p.17), the scholarship of teaching needs to take into account what is known about learning; including scholarly inquiry into how students ‘make meaning’ from what the teacher says and does. These elements collectively illustrate the importance of the distillation and integration of knowledge into teaching, through both curriculum content and teaching practices/processes. They also illustrate the scholarly role of research at the foundation of the scholarly continuum. Part B2 (requirements for seeking self-accrediting authority). The requirement for providing relevant up-to-date learning resources in Standard 3.3.1 also implies that the selection and use of learning resources is informed by on-going engagement with new developments in disciplines and fields of education, as is the selection of learning outcomes (1.4.2). The learning outcomes for research training (1.4.5) specifically require a detailed understanding of a specific topic of research, within a broad understanding of the field of research. The intent of the Standards in relation to scholarship is manifold. The Standards also encompass both the process of scholarship (e.g. academic staff are engaged in continuing scholarship) and its outcomes (e.g. course design is informed by current scholarship). B1.1.3 The higher education provider delivers teaching and learning that engage with advanced knowledge and inquiry. B1.1.4 The higher education provider’s academic staff are active in scholarship that informs their teaching, and are active in research when engaged in research student supervision. B1.2.3 The higher education provider undertakes research that leads to the creation of new knowledge and original creative endeavour at least in those broad fields of study in which Masters Degrees (Research) and Doctoral Degrees (Research) are offered. B1.2.4 The higher education provider demonstrates the commitment of teachers, researchers, course designers and assessors to the systematic advancement and dissemination of knowledge. B1.2.5 The higher education provider demonstrates sustained scholarship that informs teaching and learning in all fields in which courses of study are offered. B1.2.6 The higher education provider identifies and implements good practices in student teaching and learning, including those that have the potential for wider dissemination nationally. B2.3.d sufficient breadth and depth of academic leadership, scholarship and expertise in relevant disciplines to guide entry into and sustain new levels and broad fields of higher education. The effect of these criteria is to require the creation of an institutional climate of scholarship, which is both a characteristic and a means of categorisation of providers according to the pervasiveness and scope of scholarship in the provider (including the scholarship of research). The intent of these criteria is that, as a minimum, all teaching and learning in higher education is built on a foundation of advanced knowledge and inquiry, that all academic staff are active in scholarship that informs their teaching, and that supervisors of research students are active in research. Within the broad requirements for scholarship at the institutional level as required by Part B of the HES Framework, the Standards in Part A address more specific points as discussed below, particularly in relation to scholarship informing teaching and learning. have an informed and advanced understanding of the field and/or how it is taught, learned and applied in practice. The Standards also intend for scholarship to pervade the research training environment by requiring supervisors to be actively engaged in research in a relevant field (Standard 4.2.3a) and for research training to engender a broad understanding of a field of study beyond the primary research topic (Standard 1.4.5a). The essence of the Standards discussed in the preceding paragraph is that the scholarship they contemplate is directly relevant to the discipline of the teaching and learning or research training being undertaken. It is not unusual for academic staff to be engaged in disciplinary scholarship or research that is somewhat or even quite remote from the field, discipline or subject they are teaching. While such scholarship may fulfil the requirements of Part B of the HES Framework (see above) by contributing broadly to institutional research and be laudable in its own right, it may be difficult or impossible to demonstrate a direct linkage to teaching or supervision as required by Section 3.2. In the absence of demonstrable and tenable links, this form of scholarship is not sufficient to meet the requirements of the Standards in relation to scholarship informing teaching. The intent of the Standards is that scholarship that is claimed to inform teaching (or supervision) must have a demonstrable relevance to the course being taught, including scholarship relating to the process of teaching and learning in itself. Aside from the practical benefits that up-to-date content and teaching methods offer to students and to the reputation of Australian higher education, it has been argued that fostering scholarship has an impact on the very nature of higher education. For example, Clement and Grant (2010, cited in Robinson and Hougaz, 2013, p.16) contend that scholarship contributes to ‘intellectual curiosity, rigorous argument, judicious use of evidence, a depth of understanding gained through serious engagement with the work of others’ – for academics and students alike. In a similar vein, ‘engagement with advanced knowledge and inquiry’ (Standard 3.1.2), as enabled by scholarship, is seen as a fundamental characteristic of higher education, and is a requirement for registration as a higher education provider (Part B1). be less equipped to identify and adopt contemporary evidence-based advances in approaches to teaching in their field. Consequently, student achievement of learning outcomes will be compromised and, in the extreme, course accreditation may be jeopardised. These undesirable consequences and their impact on students will be made worse if a lack of engagement in scholarship at an individual level is compounded by a lack of engagement at an institutional level e.g. by those with leadership responsibilities for designing and monitoring units and courses of study, or for setting academic policy or allocation of scholarly resources. Scholarship must be part of the institutional environment and culture. For example, if institutional policies do not create expectations for scholarship, it is less likely to occur. Similarly, if allocation of resources to scholarly resources (e.g. library collections and other information resources, conference participation, academic development opportunities) does not support scholarship sufficiently, participation will be impeded even if staff are willing. Such a culture will have an adverse impact on leadership by example (e.g. Standard 3.2.2) and may impede a culture of collective intellectual inquiry (e.g. Standard 6.1.4). In these circumstances, registration as a higher education provider may be jeopardised. All of these possibilities, or any one of them, will also have an unacceptable adverse impact on the reputation and expectations of Australian higher education overall. This part of the guidance note covers the full extent of the Standards, and corresponding evidence that TEQSA may require, in relation to scholarship. For new applicants seeking initial registration and course accreditation, TEQSA will require evidence to be provided in relation to all relevant Standards. For existing providers, the scope of Standards to be assessed and the evidence required may vary. This is consistent with the regulatory principles in the TEQSA Act, under which TEQSA has discretion to vary the scope of its assessments and the related evidence required. In exercising this discretion, TEQSA will be guided by the provider’s regulatory history, its risk profile and its track record in delivering high quality higher education. TEQSA’s case managers will discuss with providers the scope of assessments and evidence required well ahead of the due date for submitting an application. The evidence required for particular types of application is available from the Application Guides on the TEQSA website. Providers are required to comply with the Standards at all times, not just at the time of application, and TEQSA may seek evidence of compliance at other times if a risk of non-compliance is identified. requirements related to categorisation of the provider and authority for self-accrediting courses of study. TEQSA acknowledges that scholarship may take many different forms within and between different providers. TEQSA also recognises that diverse strategies to develop, support and sustain scholarship, both at the institutional level and at the level of individual staff, have been identified in the literature and in evidence presented to TEQSA previously. There is a range of activities that can contribute to the advancement of knowledge or professional practice, but will not necessarily do so. TEQSA will ask providers to submit information about outputs from these activities that constitute evidence of scholarship. undertaking advanced specialised practice or scholarly secondments. An issue that sometimes arises is the extent to which performance or creation of creative works (such as music, drama, art and design) can constitute scholarship. TEQSA’s view is that routine performance or production would not in itself constitute scholarship. The staff member would need to demonstrate the scholarly dimension through a cogently articulated rationale that contextualises the project within the field, clarifies the significance of the intended outcomes and forms the basis for communicating relevant insights to students. Some form of peer review should be undertaken. TEQSA will need to view these activities in the light of whether they are evidence of a scholarly environment more generally, or evidence of scholarship informing individual teaching or supervision, where individual teachers will need to be participating in scholarship that is relevant to their teaching roles and informs their teaching as required by the Standards. A higher education provider registered in any category must be able to satisfy TEQSA that its staff are active in scholarship of some kind that informs their teaching. Where necessary, TEQSA will review the background and activities of staff for evidence of the extent of staff involvement, the scope of the activities and the legitimacy of claims (as outlined above). This may involve a sampling strategy, selecting teachers in particular courses or organisational units or a combination of these, to be agreed with TEQSA, or in the case of smaller providers, a full listing of staff scholarly activities within the past five years. A provider applying to change to one of the university categories must be able to demonstrate sustained scholarship that informs teaching and learning in all fields in which courses of study are offered over at least the preceding five years. TEQSA may consider the extent of institutional support for scholarship (as discussed below) as required. the extent of institutional activities to support scholarship, e.g. seminars, discussion fora. advancing approaches to teaching and learning in that discipline/field. If a claim is made for scholarship through undertaking professional practice or related activities, those activities must meet a test of relevance to the discipline/field being taught and also be linked to advances in practice. Scholarly engagement must also be at a level consistent with the level of teaching and learning concerned and embrace advanced understanding at, or above, that level. In making these interpretations about acceptable evidence of scholarship, TEQSA does not seek to limit diversity of approaches or to prescribe ‘types’ of scholarship (e.g. as proposed by Boyer, 1990), although these may provide useful frameworks. Provided the tests of relevance and level (outlined above) are met, TEQSA would not wish to form a view on whether any particular type of scholarship is to be preferred, but all providers should develop both disciplinary scholarship and the scholarship of teaching and learning. 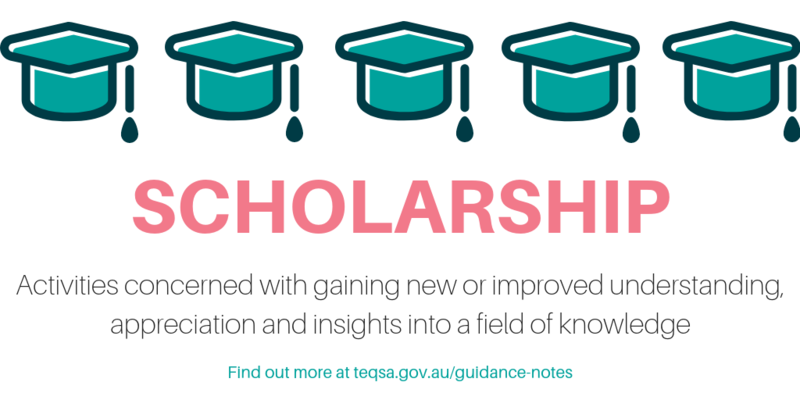 In considering the role of scholarship in the design, staffing and delivery of courses of study, TEQSA will need to be satisfied that the requirements of the relevant Standards (Sections 3.1, 3.2, and 3.3) are met and are likely to continue to be met. TEQSA would expect to review this as part of a course accreditation or re-accreditation process for one or more courses of study. This may involve peer review by an expert in the field of study. students are referred to, and engage with, relevant scholarship through the course. In the case of scholarship related to research training, TEQSA will need to be satisfied that the training can be provided in a supervisory and study environment of research activity or other creative endeavour, creativity and scholarship, as required by Standard 4.2.2. In so doing, TEQSA will consider the specific research mission and scale of the provider and the maturity of its research activities. This is likely to be done in consultation with the provider’s case manager. TEQSA has prepared separate Guidance Notes on Research and Research Training. personal or professional development activities that are not related to the teaching role or constitute lower-level training, e.g. learning an unrelated research technique, taking a course in an unrelated field, or learning to operate new software. exploring, testing, practising and communicating understanding of what practices are most effective in the context of the discipline (pedagogical content knowledge). Boyer, E. L. (1990), Scholarship reconsidered: Priorities of the professoriate, Princeton, NJ: The Carnegie Foundation for the Advancement of Teaching. Clement, M., & Grant, B. (2010), Scholarship in times of super complexity: Various accounts of what it can be and how we need each other to enact it, International Journal for Academic Development, 15(2), pp.101-103. Higher Education Academy (HEA) Resources Page. Office for Learning and Teaching Resource Library. Resources about the scholarship of teaching and learning on International Society for the Scholarship of Teaching & Learning (ISSOTL) website. Rice, R. E. (1992), Towards a broader conception of scholarship: The American context, in T. Whiston & R. Geiger (Eds. ), Research and higher education: The United Kingdom and the United States, Buckingham: SRE and Open University Press, pp.117-129. Robinson, W. and Hougaz, L. (June 2013), A culture of scholarship: Opportunities and challenges for the non-university Higher Education sector, The ACPET Journal for Private Higher Education, (2)1. TAFE NSW presentation by Professor Shirley Alexander to TEQSA Provider Briefing (October 2013), Scholarship and its application in practice: 2 views from higher education. TEQSA (2016), Explanations of terms in Part A of the HES Framework 2015. THINK Education Group presentation by Linda Brown to TEQSA Provider Briefing (October 2013), THINK Scholarship. Williams, M., Goulding, F. & Seddon, T. (2013) Towards a culture of scholarly practice in mixed-sector institutions, National Centre for Vocational Education Research. Updated for the HESF 2015 and made available as beta version for consultation. Paragraph added relating to creative activity and scholarship. Clarification to differentiate and define ‘scholarship’ and ‘scholarly activity’. 2.4 4 December 2018 Amendment to the end of the section on 'What does scholarship encompass?' in relation to the Boyer Model of Scholarship. The HEA in the UK has funded a large number of projects and subject centres to work with and provide support and resources for their discipline areas. This library contains a collection of higher education learning and teaching materials flowing from projects funded by the Commonwealth of Australia, including those from the Australian Learning and Teaching Council.